In this tutorial i will show you how to find highly targeted expired domains with relevant backlink profile to redirect to your blog, sales pages or landing pages. We will be using my new tool for finding broken links in YouTube called VidSpy Alpha. This tool searches YouTube for links in YouTube video descriptions that are broken links and then it searches to see if they are available domains. YouTube is the second largest search engine on the internet and it has massive amounts of traffic and search volumes, however its a different type of search usually when people are searching for videos. We can take advantage of both these facts as you will see below. It’s a fast, fun and simple tool that can find really great domains if used with this strategy. 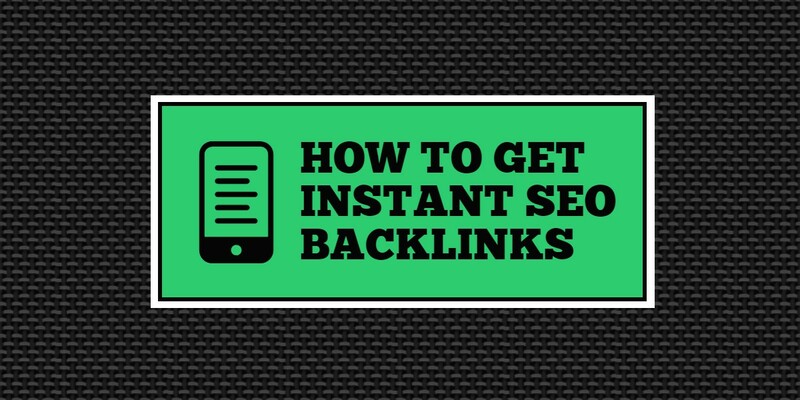 Find domains with a backlink profile that fits our blog or landing page that we want to get some decent, relevant backlinks to quickly. So for this example i have a reseller license for HQ Webinar and i want to create a blog post about the tool and why it’s great value at $297.00 one time cost direct from myself rather than pay $97 per month from HQ Webinar direct. I have already started running a traffic scout campaign to find keywords that are easy to rank and that have traffic, and i have some main keywords that are more competitive with large search volumes that i want to rank for too with the same blog post content. In the URL Finder Tool I search for 4 keywords. As you can see i chose 4 keywords that fit in what what people may be searching for who want to use webinars, to make money from webinars or who are looking for a specific webinar software which just happen to cost monthly recurring fees. Simply because i didn’t feel like having too many keywords that would require me to go and get proxies and authorise my IP in Squid Proxies lol. Let’s break that down into a simple formula to repeat any time we choose. We do like simplicity don’t we? ? Here’s an example of that formula in action for a Youtube optimization tool that i want to rank a review post for. If i did not find some decent domains from this search i would have expanded the search with more keyword phrases. 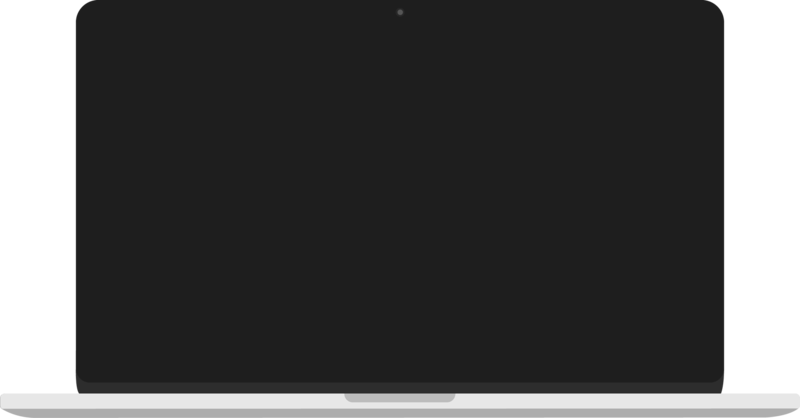 So in the image you see that i have red arrows for the 4 simple steps needed in the software. I checked immediately to see if it is available as the software indicated and yes it was and even better, it cost only 98 cents! So the next step is to head over to Ahrefs and see what we can find about the backlink profile, the types of sites linking in and their authority. Remember that these links will all be redirected to my blog post so we are looking for relevancy and this is why the URL finder tool is the best and easiest way to do this strategy. It consistently works like a charm for this strategy, time and time again. 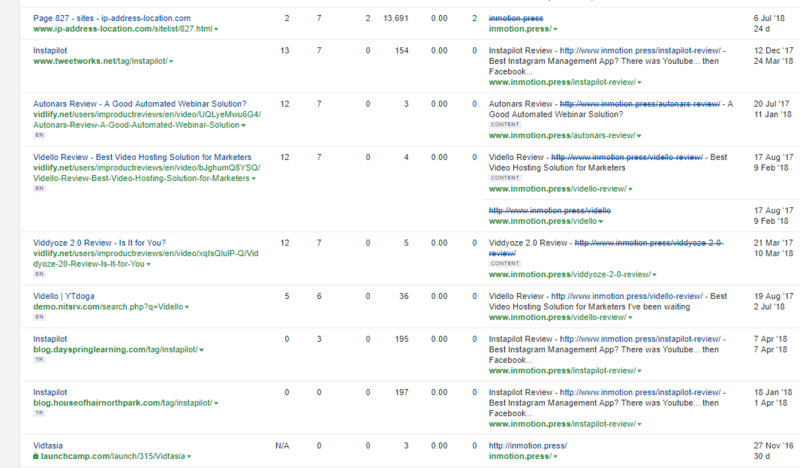 Ok, what stands out here is that there are 56 backlinks from 13 referring domains, thats a good ratio. So far, so good! 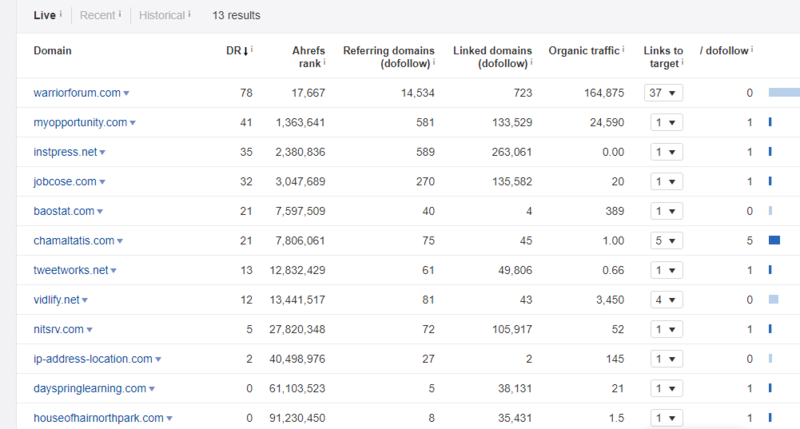 We have 13 Dofollow links and 43 Nofollow links which seems a bit odd but it suggests that the domain hasnt been spammed by any SEO lol, so my interest is still peaked. The anchor text profile is good, nothing spammy here, its branding and urls…interest is still peaked! The next step is checking the domains that are linking in. Here we see a “natural” mix of high DR (Domain Rating) sites linking in and we see an instant strategy we can use to make it more powerful but more on that later. We have one slightly dodgy link and we have warriorforum with 37 links to this domain. The article topics linking in from are relevant with some well known video tools and (Videoze, Vidello, Autonars) and these are review posts. That’s a decent backlink profile, it’s not spammy, its natural and its relevant. This domain is perfect to buy and redirect to my blog post! To follow the steps for the redirect process you can watch this course that i started on how to do this. I prefer to build a site and reindex it and drive some more backlinks to it before redirecting. This will be a simple autoblog that i will index within minutes and run some daily content for a few weeks (6 to 8 weeks usually) with no links coming from there to my money site before i redirect it. This also allows me to redirect from htaccess or cpanel to make sure that all previous urls get redirected to my blog post. That will be 50+ links from 13 referring domains and plus any additional backlinks that i send to the domain before i redirect. This also gives me an opportunity to balance out the Dofollow/Nofollow ratio in the meantime and to do this we have a ready made strategy. The warriorforum linking in tells me that adding some additional high profile form links from the internet marketing niche will not do any harm, in fact it will look completely natural. I will add to this some high trust flow expired web 2 blog links to the root domain too and some video sharing site and social bookmark links. 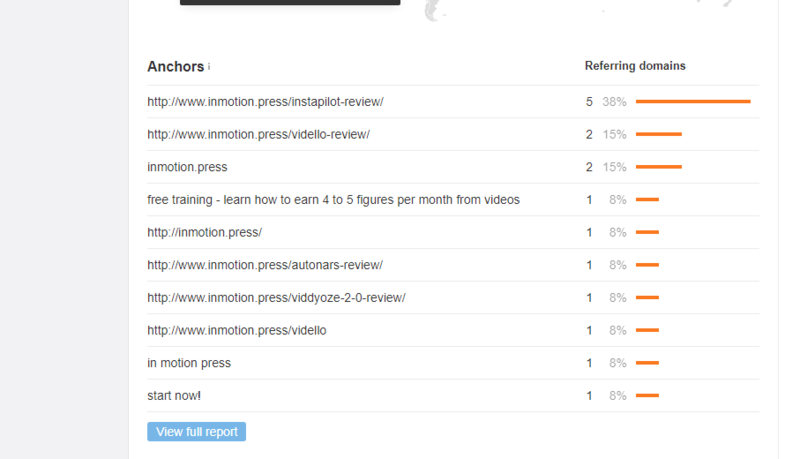 When the blog post for the HQ webinar review is published this will add some initial links and i have some quick traffic strategies that can be added to to make sure than the links don’t look out of place and that the amount of links will fit the traffic. 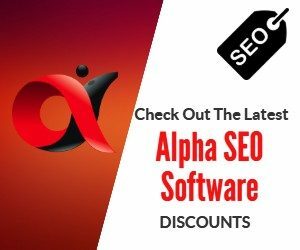 I will also create 2 Vid Attack Alpha campaigns to a YouTube video which will be my HQ webinar review and another video which will be a demo of HQ webinar. The YouTube Videos must have just ONE link in the descriptions to the blog post and the videos will be embedded on that blog post too and video sitemap on the blog will be pinged too. The URL finder is a great little tool if used correctly.